Baudinet makes contact at Fenway Park in Boston in 2009. Walk into the Admissions office, take two lefts, and you arrive at the office of Mr. Brian Baudinet. Most know him as a friendly face and the coach leading a promising Saints squad in his second year as head basketball coach. One thing you might not know is he is the Atlantic 10 Conference record-holder for the most home runs in a baseball game. A basketball and baseball player at the Taft School and Blair Academy, Baudinet intended to play Division III basketball at the University of Rochester, but injuries forced him to temporarily set aside his true passion. While Baudinet accepted that playing basketball was no longer an option, he did not let his injuries prevent him from pursuing his dream of playing college athletics. In fact, he would trade playing basketball at Rochester for playing Division 1 baseball at the University of Massachusetts. 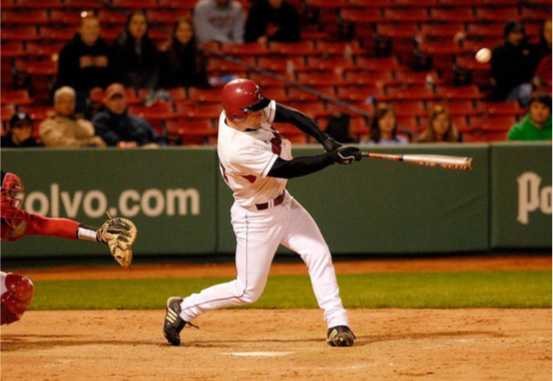 In just his second year on the team, Baudinet announced himself as an offensive force, batting .351 and leading the team with an on-base percentage of .442 during the 2009 season. Due to the injuries he suffered at Rochester, he still had a year of NCAA eligibility left after graduating from UMass. He decided to finish his NCAA career out, posting an impressive batting average of .321 in 2010 that included his famous 5-5 performance against George Washington. After a single in his first at-bat, Baudinet hit a home run in each of his last four trips to the plate, earning a place atop the A-10 record books. Meanwhile, for a “hobby”, Baudinet’s career as an outfielder is also quite impressive. Despite “only” being ranked eighth in games played for the Minutemen, the two-year captain is currently the program’s fifth most prolific hitter all-time and fourth in total bases. Record-breaking exploits, however, did not affect basketball’s position as his true passion. Following his final season of baseball, Baudinet accepted his first coaching job in basketball, becoming an assistant coach at Division III Trinity College. After three years in Hartford, Baudinet moved about forty-five minutes north for a brief stint with Division II American International College, a ten-minute drive from the Basketball Hall of Fame in Springfield, MA. After just four months there, however, Baudinet received his first ticket to the big time. In October of 2013, he moved to the pros, accepting a position as an assistant coach and video analyst for the Tulsa 66’ers, then the NBA Development League affiliate of the Oklahoma City Thunder. In Tulsa, Baudinet worked closely with former and future NBA players, which helped mold his current philosophy of player development. Perhaps the most notable player Baudinet assisted in Tulsa was André Robertson. Robertson, the twenty-sixth pick in the NBA draft, spent most of his first season with the Thunder organization on assignment with the 66’ers. Baudinet helped him make the transition from the University of Colorado to the NBA, working on everything from ball skills, passing, and defending multiple positions on the floor. Robertson would go on to earn a starting shooting guard spot with the Thunder during the 2014-2015 season, and would go on to establish himself as one of the Association’s elite perimeter defenders. In fact, he would be named to the NBA All-Defensive Second Team in 2017, but is currently sidelined with a ruptured patellar tendon. In addition to developing as a coach in the D-League, Baudinet also joined the Thunder staff during the preseason and postseason, allowing him to work with some of the best in the game. Assisting professionals obviously has its differences from coaching collegiate and high-school athletes, but Baudinet places great value in the opportunity he had to view how a professional organization operates on a daily basis. From all-stars like Kevin Durant and Russell Westbrook to new coaches like himself, he notes that the culture of respect and accountability applied to all. Baudinet stresses that he aims to imitate the “detail-oriented” mentality of the Thunder wherever he goes. After continuing to help pro players at private-training facilities for a short time, Baudinet made the jump back to college basketball. He notes that accepting a position on the Duquesne University coaching staff in 2014 – and eventually being elevated to primary assistant coach in 2016 – represented an almost cyclical journey. In his first year at the helm at Canterbury, the “little victories” he emphasizes began translating into big results on the court. A two-point win against Trinity-Pawling on February 14th clinched the Tri-State League title, and was followed by a one-point home win over national powerhouse South Kent just four days later. The incredible season came to a close after a second-round Class B playoff loss to Rivers. Upon reloading talent after some notable departures, Baudinet has led Canterbury to a fast start this season, which already includes dominant wins by over twenty points against traditional rivals Taft and Kent. Basketball has brought Baudinet from prep school to the pros and back. If his initial campaign is any indication, Canterbury basketball seems poised to challenge for NEPSAC crowns not only this season, but for many years to come. What’s in the little white house across from Steele? Nancy Mathewson Fish on Meet Canterbury’s Newest Addition!